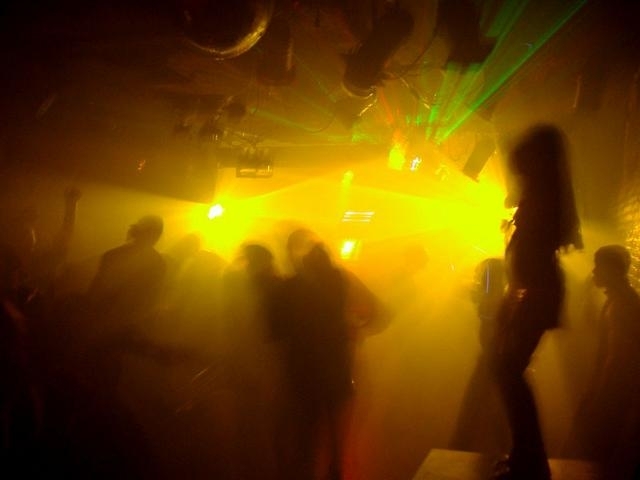 I found this article from eHow.com to be quite amusing and accurate of the “scene” at Dallas goth-industrial clubs/events. The Tips & Warnings portion at the end of the article was particularly flattering of the scene too. I hope you like it as well. Whether you’re a nightlife newbie or a clubbing regular, Gothic and industrial clubs offer a fun, all-inclusive atmosphere. However, the Goth clubbing scene has its own unspoken rules of etiquette. This guide will tell you how to dance with someone, dress, and fit into this exciting scene during your first visit. 1. — Wear black. Many Gothic and industrial parties have door policies by which a visitor can be charged up to three times more than a partygoer in black or scene wear. Ambiance is an important part of the Gothic experience, so leave the khakis and baseball caps at home. 2. — Don’t stare at or make fun of the patrons of the club. At Gothic events, it’s common for women to wear bikini tops, corsets, mini-skirts or other risque fashions, since these women regard scene parties as safe zones for self-expression. Improper touching or comments will get you thrown out immediately. 3. — Dance as much as possible [and I would add here: “don’t drink so much and NOT dance!” Idleness is fertile ground for immature B.S. gossip & drama!]. Gothic parties are all about having fun and enjoying the music. Be aware of the other patrons’ personal space. First-time visitors should leave the middle of the dance floor to club regulars as a matter of etiquette. Never simply stand on the dance floor, since it’s considered rude and a waste of space. 4. — Wear protective footwear to the party. Gothic boots are heavy, many of them with steel toes or huge platforms that could injure unprotected feet. Never wear flip-flops or other open-toed shoes, unless they have a platform. 5. — Talk to patrons politely. Many are friendly and approachable, but loathe drunks or arrogant people. It never hurts to open a conversation with a compliment or question. Scene regulars, or “elders”, can have bothersome visitors ejected with little fanfare. 6. — Be observant. Many styles of dance associated with industrial music resemble moshing, with some good-natured pushing and shoving between friends. Keep your eyes and ears open to what’s going on to avoid being hurt. This entry was posted in Night Life and Entertainment and tagged club etiquette, good club manners, gothic attire, gothic club etiquette, Gothic clubs, industrial attire, industrial club etiquette, industrial clubs, night clubs, Pyramind NYC by Professor Taboo. Bookmark the permalink. Glad you liked it. Great shoes, pumps, platforms you have at your site! I know lots of hot gothic, industrial, & steampunk female friends who’d wear them & look fantastic in them! All the best!